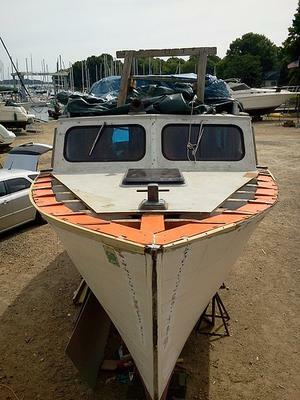 I enjoy looking at all of the projects here on DIY Wooden Boat, so I decided that I would post my own project. 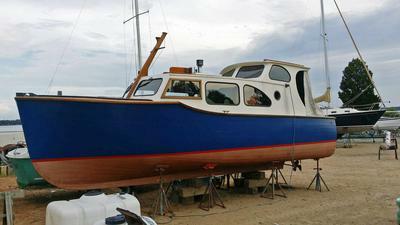 I'm 2 and a half years into fixing up this 27' Ed Monk wooden cruiser. She was rotting away uncovered in a field on a lake up in Vermont when I came across her. I low balled an offer and it got accepted so I trucked her down here to Lake Norman in North Carolina. Ed Monk Sr. was a big designer of rugged cruising boats mainly on the west Coast. My boat was built in Washington state, cruised Alaska, and somehow ended up in New Jersey before finding here way up to the Lake George region of NY state, and eventually VT, so she's a real rarity for this side of the country. Of course my initial self survey didn't begin to uncover all the problems that plagued my boat. 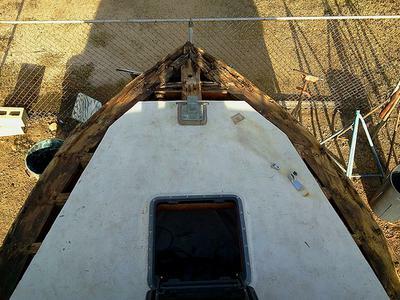 So after 2 new frames, 5 sistered frames, new breasthook, forward deck, graved stem, 14 frame tops, new deck shelfs, garboard planks, cockpit flooring, port & starboard step ups, side boards, 4 planks, all new circuit panel and AC wiring and a complete wooding to bare hull, she's starting to look much better. I soaked her up last season for a week and she did pretty good. The perkins 4108 diesel fired right off too, which was a big relief! I've learned a lot working on her. I really enjoy the process of working in wood (white cedar on white oak frames). I'm shooting for a July 2014 launch date. PS. 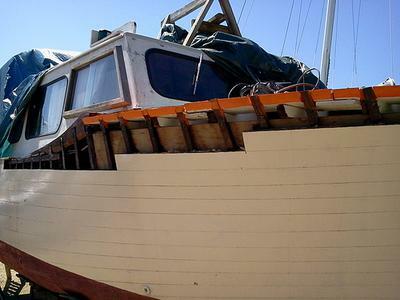 I've also learned that fixing up an old wooden boat is actually more expensive in the long run than buying one that is already in moderately good shape. When you take into account the cost of materials, yard storage bills, and equipment repairs & replacement. Hole in the Water (air/pocket). I would not share this with Susan and I have a nice place to float that cruiser.